Home > Latest > Lifestyle > Back Pain or Neck Pain? Try changing your Keyboard and Mouse. Back pain is most common today for people who spend the majority of their time with computers in a day. When I say back pain, it includes pain in lower back, spasm on the side region of back, and shoulder, stinging pain in middle back, unbearable pain in upper back 3 inches below the neck, neck pain, stressed shoulders and many more. Sitting in computers for a long time not only induces back pain. Pain in elbows, wrists, palms, especially in the ring and the little fingers are other major pain caused by extensive computer usage. These pains are caused by consistent stress or irritation on the muscles. To reduce the strain and irritation, one should maintain the right posture while working on computers. Watch your movement patterns. There’s plenty of videos available on youtube about this posture. Those videos are not for those who already in pain. I recommend not to follow those videos blindly without consulting a physiotherapist. Conventional Keyboards are not built with a design to support our natural hand movement. So the mouse. That’s why working for hours with these keyboard and mouse cause muscle damage. The posture of the hand, movement of the fingers to type directly affects your back, that too you middle and upper back. Most of you have already felt the searing pain in elbows, shoulder joints, and wrists. Making small changes to your keyboard design will greatly reduce the strain to your muscles. Use ergonomically designed curvy keyboards or split keyboards. These curve keyboards or split keyboards give you the inverted ‘v’ position for your hands when you place fingers on it. That is how hands should be naturally. There are few budget-friendly ergonomic keyboards available on Amazon.in. If money doesn’t matter to you go for Kinesis’ Advantage 2 or Freestyle 2 like keyboards. When it comes to mouse, the conventional mouse force you forearm to twist to hold it. Moving the mouse and clicking the mouse buttons with same twisted position strains the joints in wrist and elbow. [Corporal tunnel Syndrome, Cubital tunnel Syndrome]. Vertical ergonomic mouses are the better alternative for the regular mouse. You can buy vertical mouse of your choice. But choose whichever is good in height, so you can hold it vertically. 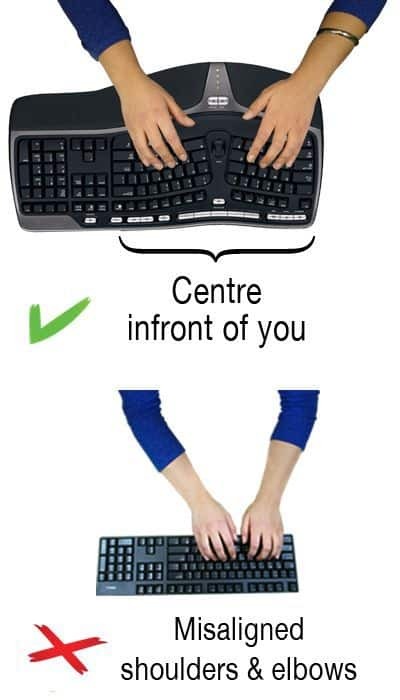 Tips for conventional keyboard and mouse users. If you couldn’t change to these ergonomic setups, then, for the time being, you can follow the below tips to reduce the strain. Use Mechanical Keyboards. These keyboard’s key gives you considerable dips to your finger presses keys when you type. These dips act like a little shock absorber. After using for days and months, you won’t press the keys harder. This will considerably reduce the strain. Also, the key placements are wider and in height little above than ordinary. This height will help you to avoid placing your wrists or palms on, which is, in turn, a good posture. If you are happy with the results of using the mechanical keyboard, you don’t even have to switch to ergonomic keyboards. Keep the mouse pad few inches before the keyboard. 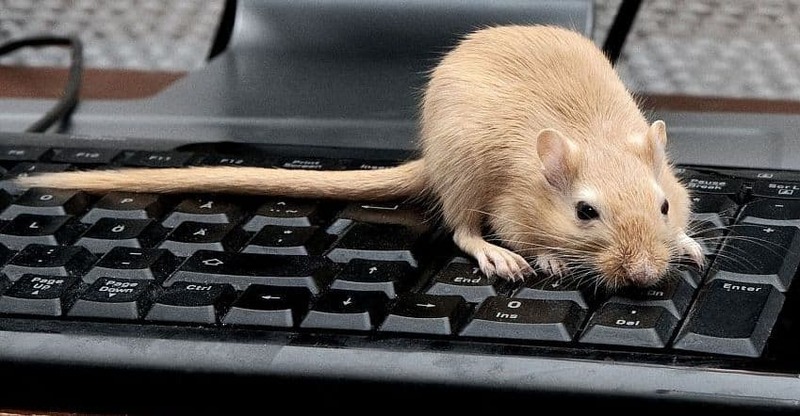 The mouse should be closer to you than the keyboard. And, it should be placed away on the right side of your body. If you want to, then rest the elbow on hand rest or somewhere, but don’t rest the entire forearm. Resting the entire forearm restricts the hand movement, which increases the stress in wrists. 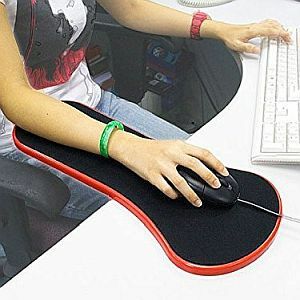 Try Arm-rest mouse pads if you use the mouse for very long. Especially if you’re working in software like photoshop. Do you have any more ideas? Share them below….